Blu-ray Video Converter UltimateBlu-ray Ultimate is able to rip DVDs, Blu-ray movies and other non-protected video files to your required formats. Blu-ray RipperThe Blu-ray Ripper software can rip/convert commercial Blu-ray movies and DVDs to any format you want. Pavtube DVD Ripper is the best DVD ripping software that provides movie lovers with the easiest way to rip and convert DVD movies to MP4/AVI/MKV/WMV/3GP and many other video and audio formats with high quality. Pavtube DVD Ripper works as a powerful DVD to tablet/smartphone/HD media player converter which enables you to enjoy DVD movie on your portable devices and HD Media Players, including iPad Pro, iPad Air 3, Apple TV 4, Apple TV 3 , Google Nexus 6P, Windows 10 phone, HTC 10, Galaxy S7, Galaxy TabPro S, PS4, Open Hour Chameleon, Popcorn Hour, Xbox One, Xbox 360, Nook Tablet, Kindle Fire, Sony Tablet S, ASUS EeePad Transformer Prime, Asus Infinity TF700, PS Vita, WD TV, MicroSoft Surface Book 2/1, Surface Pro 4/3/2/1 and more. 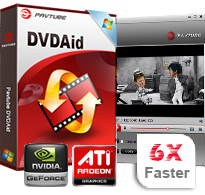 Pavtube DVD Ripper takes full advantage of NVIDIA's CUDA technology and ATI Stream (AMD APP) technology to largely accelerate conversion speed. The GPU acceleration saves users lots of time when using H.264 codec to do format conversion. NOTE: To use GPU computing feature, a CUDA-compatible NVIDIA graphics card or an AMD graphics card with AMD APP technology must be installed. The CUDA and AMD APP acceleration both work only when creating H.264 encoded video files. You can select your desired subtitle, audio track and camera angle when doing the real-time previewing on the right window of the main interface. Pavtube DVD Ripper adopts advanced audio and video in sync technology, which guarantees you a perfect playback performance. Thank you for your excellent services! It's simple to use and well worth the investment. Highly recommended. Q: How to rip a DVD movie into one file instead of in chapters? ? Q: I have just downloaded the new update for the software, do I need to uninstall my older version prior installing the new one or I just install the new application on top of the old one. Please advice.? How to Play DVD Movies on VLC Player? - Fixed some bugs on DVD burning. - Added ISO image file or disc burning feature. 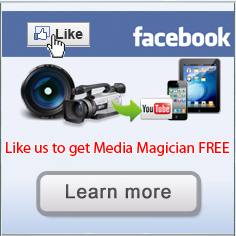 - Better media player for previewing.